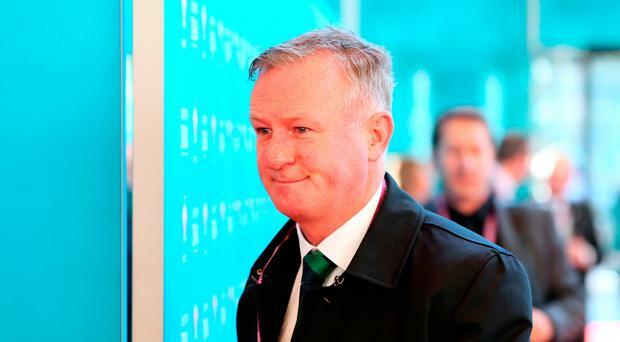 Michael O'Neill has admitted that Northern Ireland's Euro 2020 group is about as tough as it gets but insists he has belief that his side can deliver another stunning qualification. Northern Ireland were drawn against the might of Germany and Holland in Dublin yesterday with Estonia and Belarus making up the five-team group. Inspiring Northern Ireland to Euro 2016 was an incredible achievement for O'Neill but given the strength of the opposition doing it this time would surpass that and arguably go down as the nation's finest football hour. The rest of Europe will be convinced the Germans and Dutch will finish in the top two and cruise to the 2020 finals but O'Neill has other ideas. "It's possibly the toughest group we could get but we have to believe we can do it," said the Northern Ireland boss. "I think we are capable of taking that big scalp, particularly at home, even against Holland or Germany and we'll need to do that if we're going to progress. "We want to be competing and for every game to have a real meaning." Northern Ireland kick off the campaign with an early chance to get points on the board with a home double header against Estonia and Belarus on March 21 and 24 next year. They are then away to Estonia and Belarus on June 8 and 11. The first big test in the group is away to Germany next September 9 followed by Holland away on October 9. Those two giants then land at Windsor Park for a massive finish to the campaign. The Dutch are here first on November 16, followed by the Germans on November 19. It will be Holland's first visit since 1977 when George Best and Johan Cruyff both appeared. The Republic of Ireland were originally drawn in Group C along with Holland and Germany but because no more than two finals host countries can be in the same group in qualifying, they moved to Group D with Switzerland, old foes Denmark, Georgia and Gibraltar.